Gallura. It is suitable for active tourists wanting to experience the life of Porto Cervo and discover the coast by car, beach after beach. 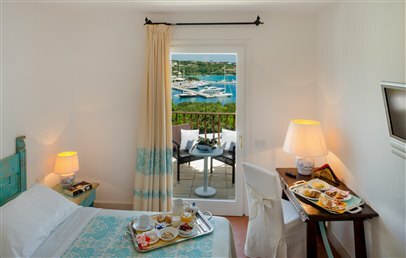 Just 250 metres from Porto Cervo’s famous square and from its luxury marina, Hotel Luci di la Muntagna is one of the Costa Smeralda’s top hotels. 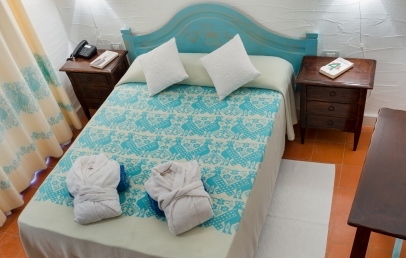 The hotel is located up on the hill on a quiet position surrounded by a big garden and offering a wonderful view over the port and the Costa Smeralda’s colourful sea. The area’s most stunning beaches are a 10 minute drive away. We recommend the airport Olbia – Costa Smeralda to fly into, the distance is approx. 32 km.. Designed by architect Michele Busiri Vici, the Luci di la Muntagna is an icon of elegance and hospitality within the most chic of Sardinia’s circles. Fully renovated in 2014, it has retained all the details of its “Mediterranean Architecture”, fluidly mixing traditional elements from Morocco, Greece, Spain and Tunisia. The white colour is dominant, terraced archways and rounded steeples feature in the internal and external areas of the hotel. The Hotel Luci di la Muntagna offers a panoramic pool with sun deck, a restaurant and two bars. The hotel’s 53 rooms are tastefully designed and furnished. All rooms provide the highest level of comfort to ensure that guests enjoy a relaxing and refreshing stay, as one would expect on the Costa Smeralda. All rooms have a TV, safe, mini bar, air conditioning/heating, bathroom with shower and hair dryer. Comfort – Queen-size bed, white walls, bathroom with glass shower cubicle and extra-large showerhead, hill view. Superior – Double or twin room, large bathroom with snowflake marble and stucco walls, large glass shower cubicle, double shower head – one extra-large fixed shower head and one handheld shower head. The terrace is furnished with a table and chairs and offers a sea view. Junior Suite 22-35 sq.m. – entrance into the living area with a sofa, large separate bedroom and bathroom with sizeable glass shower cubicle with double shower head – one extra-large fixed shower head and one handheld shower head. Suite 35-55 sq.m. – large entrance into the living area with a sitting room that can also be used for private dinners, wardrobe, spacious bathroom with sizeable glass shower cubicle with double shower head – one extra-large fixed shower head and one handheld shower head (some suites also have a bathtub). Tea lovers will particularly appreciate the tea corner kitted out with a kettle, cups, teapot, a selection of teas and infusions, milk and anything else you may need for tea time. International dishes and Km 0 products await guests in the hotel restaurant’s elegant indoor dining room or on the terrace that enjoys panoramic views. The restaurant, which is also open to non-residents, offers an international buffet breakfast (08:00–10:30) and dinner with table service (19:00–23:00) for guests on half-board. Lunch (12:30–14:30) and à la carte dinner are also available. Aperitifs and light lunches are available from 11:00 to 23:00 at the snack bar located close to the pool and at an indoor bar that offers guests a welcoming dining room and panoramic terrace with views over Porto Cervo. Various activities such as golf, surfing, sailing, snorkelling and diving, trekking, Nordic walking, and horse riding can be organised in the hotel’s immediate proximity. A 24 hour reception desk is available for information on boat or land excursions and on historic sites not to be missed. Wi-Fi is available throughout the hotel. The hotel Luci di la Muntagna also welcomes small pets in possession of documents and insurance (extra charge, to be requested upon reservation). Comfortable rooms with big windows facing the southern side of the hotel with hill view. They have a large wardrobe, terracotta tiles and soundproofed fixtures. The bathroom has a shower, hairdryer, complimentary toiletries and high-end terry towels. Welcoming and bright thanks to their large glass doors, these rooms have spacious bathroom in snowflake marble (shower, hairdryer, complimentary toiletries’ set, terry towels). The pastel colours of the sophisticated Sardinian-style decor foster true relaxation. The terracotta tiles and white walls create the warm intimacy so typical of island settings. 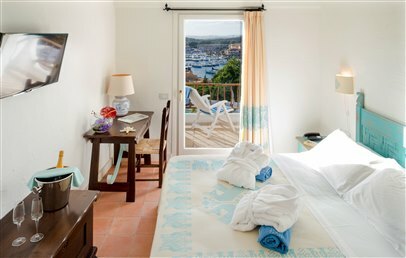 A balcony with table and chairs provides you with stunning views of Porto Cervo’s marina. One of our best-loved rooms, the Harbour Junior Suite has a welcoming entrance area with large wardrobe, a living room, a separate bedroom with bathroom. The traditional and sophisticated Sardinian furniture and finishing touches, as well as the pink terracotta tiles, create an intimate and enchanting ambiance. Each room has a little balcony facing the sea. The sofa in the living room can be converted into a bed. Elegant and romantic, the suite offers two separate main rooms – one for the day and one for the night, with pink terracotta tiles and soundproof fixtures. The living room is perfect for hosting private dinners, and opens onto a veranda with a stunning view of Porto Cervo’s marina. A charming terrace adds to the beauty of the bedroom, and the bathroom has a shower, hairdryer, personalised complimentary toiletries’ set, high-end terry towels, soft cotton bathrobe and slippers. Tea lovers will particularly appreciate the tea corner kitted out with a kettle, cups, teapot, a selection of teas and infusions, milk and anything else you may need for tea time.